Dr. Weigman earned her medical degree from Mercer School of Medicine in Macon and a B.S. degree from the University of West Georgia in Carrollton. She completed her residency at St. Vincent Health in Indianapolis, Indiana. She specializes in family medicine and internal medicine. A Georgia native, Dr. Weigman is married with three small children all under the age of 6. So when she’s not at YTH, you can find her cherishing her time with family. The Weigmans just returned to the area after their jobs took them to Nebraska. Dr. Weigman says she’s really glad to be back, close to her roots. YourTown Health’s Senoia clinic is at 48 Main Street, Suite 3A. Hours are 8 a.m. – 5 p.m. Monday, Wednesday and Thursday; 11 a.m. – 8 p.m. Tuesday; and 8 a.m. – 12 noon Friday. To make an appointment, please call 678-723-0400. YourTown Health is a non-profit network of six community health centers serving the communities of Meriwether, Pike, Lamar, Carroll, Coweta and South Fulton counties for 40 years. The centers provide access to quality primary care, pediatric care, women’s care, dental care and more, regardless of a patient’s ability to pay. 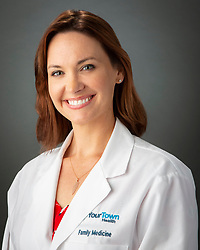 YourTown Health – Your Family. Your Health. YourTown. For more information, please visit www.yourtownhealth.com.